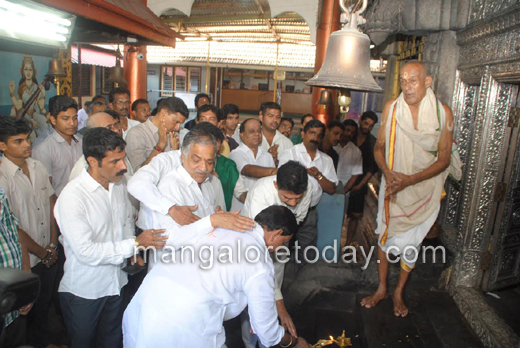 Mangaluru Sep 14, 2016: Nethravathi Rakshana Samyuktha Samithi led by Vijay Kumar Shetty and MP Nalin Kumar Kateel offer prayer at Kadri Manjunatheshwara Temple today September 14 Wednesday, seeking blessings of the almighty for the success of Yettinahole hearing on September 21. After offering Prayers in the temple MP Nalin Kumar Kateel said that, it is necessary to bring an end to Yettinahole project and we are offering prayers in Temple, Mosque and Masjid so that the hearing will turn in our favor. We strongly believe in peaceful protest rather than pelting stones and hoping that court hearing will turn in favor of Dakshina Kannada. President of Nethravathi Rakshana Samyuktha Samithi Vijay Kumar Shetty said that, samithi’s next move will be decided after the courts hearing and prayers are offered for the success of Yettinahole hearing. As per our expectations the case moved to Delhi from Chennai bench. This time our state is facing rain deficit and reason behind this is deforestation. Several tress are axed in western ghats which has effected gravely.